If you have browsed through my blog, you will see various interior colors and the effects that colors have on the majority of the population. So what do you think about green? Touring homes for sale in Oakland and Berkeley, I think sage green is the number one color right now. 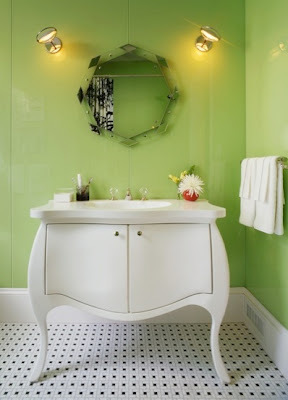 I love green with lavender and red, and I even love this lime green, pictured here. Green creates security and it has also been known to heal the heart. By the way, this photo is from the 2006 Decorators Showcase House in San Francisco. I absolutely love this bathroom sink, as it is fabricated out of Corian. That means no rotten wood vanities in the bathroom, no grout or mildew, and it comes in five colors. The sink was designed by Steven Miller Design Studio. One more thing!! The green walls are covered in glass, so you can Windex,(or vinegar and water) your walls clean.